MyMemories Blog: Meet this week's Featured Designer! It's *by the Shore designs*!! Meet this week's Featured Designer! It's *by the Shore designs*!! I began scrapbooking in 1994 and started adding digital pages to our albums in 2005. 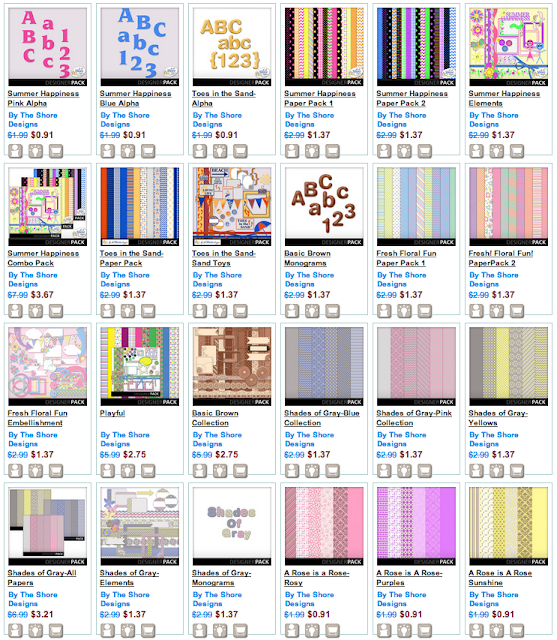 I am excited to combine my passion for scrapbooking with my love of computer art and design to create digital kits and scrapbooking templates for your use. My style is simple and clean and I love to let my photos take center stage on my pages. (That's a clever way of saying journaling is not my favorite, but I do try to sneak in a few words here and there.) I am in my fourth year of taking a 'picture a day' and can honestly say I am current in 2012 ~ we won't talk about 2009-2011, wink wink - but I am close on those too. In addition to digital scrapbooking and designing; I enjoy crocheting, zumba, walking, and my newest passion - Mixed Media. I volunteer at my daughter's school whenever possible, teaching a volunteer K-6 Art Program, creating a custom yearbook and whatever else needs to be done. I love to learn and take whatever classes come my way especially those for Adobe Photoshop, Adobe Illustrator, Mixed Media and Photography. I am thrilled to be here at MyMemories. Thanks for taking a few minutes to get to know "me". Take a peek at just some of the fun stuff in her shop!! Pick out your favorite and name it in the comments below - she will be giving a KIT OF YOUR CHOICE to FIVE Lucky Ducks! So be sure to enter to win! My favorite is THE shades of Grey elements. I would love to win it! I like the basic brown collection! Very nice designs, nice use of color! Thanks for the giveaway! I like the Summer Happiness Combo Pact, great colors. I love the Summer Happiness collection! The colors are gorgeous! Congratulations on being Designer of the week and thank you so much for the chance to win! since its football season, I love football fun! super kits! thanks so much for the chance! I love football during the season as well! I love the Summer Happiness Combo Pack. Love the summer Happiness combo pack...Can't get enough of Summer! All of these kits are amazing! This post contains so many beautiful designs!I like all the designs something about the bright colors just cheers you up.Her designs are amazing and love them all.